Love America -- or give it back. The squid I am using here is frozen. If you can get hold of fresh squid, even better. 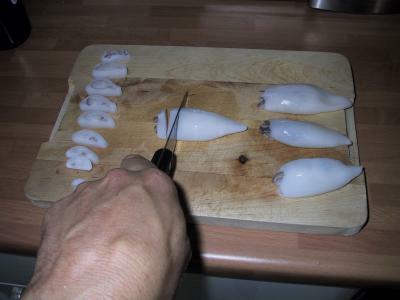 Take out the transparent, hard bit in the middle and cut the squid into slices. ... and the hot chilli paste. Add the salt and mix the whole lot together. 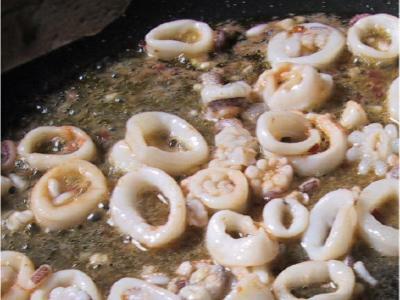 Heat up some olive oil in a frying pan and add the squid. 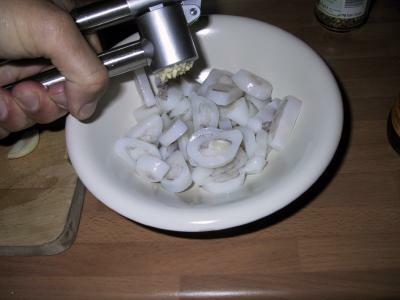 Fry the squid for no more than one minute (from frozen), less if the squid if fresh (45 seconds max). 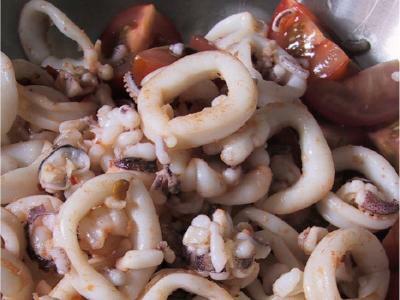 This is very important - if you fry the squid too long, it will get rubbery. As soon as the squid looks like in the photo on the left, it's time to take it out! 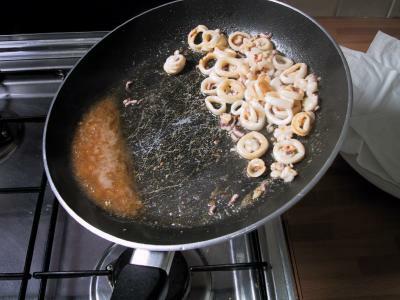 To separate the squid from the liquid that has built up, tilt the frying pan first to one side so that the liquid and the squid collects there. Then tilt the pan back into the other direction - the liquid will collect there. 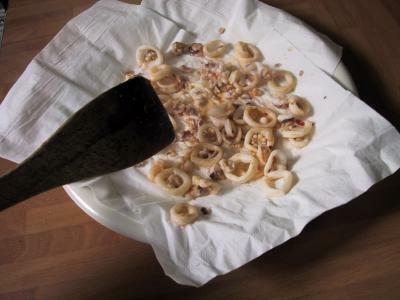 Take a spatula and take the squid out of the frying pan and onto a plate that you have covered with a couple of pieces of tissue - this will drain off the rest of the liquid. Let the squid cool down. 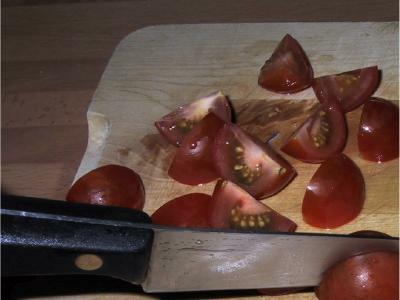 ... and the tomatoes. I'm using cocktail tomatoes here for looks and taste. 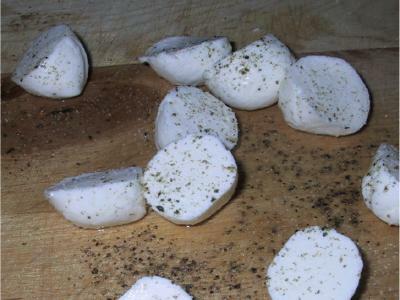 If you can get hold of small mozzarella balls, use those and cut them in half.. If not, take a normal size mozzarella ball and cut into chunks. Add some salt and pepper. 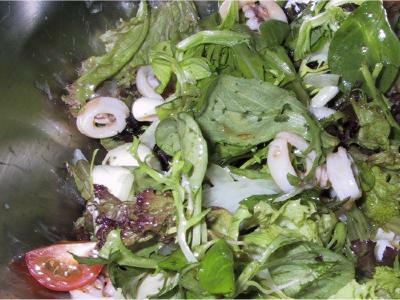 Put the onion, tomatoes, mozzarella and squid into a salad bowl. 3 Holy moly, I think I just got a twitch from wanintg that so badly.Fortunately when I get home I'm totally going to hit that. I have one beautiful tomato left from my last farmers market visit and basil in my garden!! 9 Well done, clear pictures, and directions. 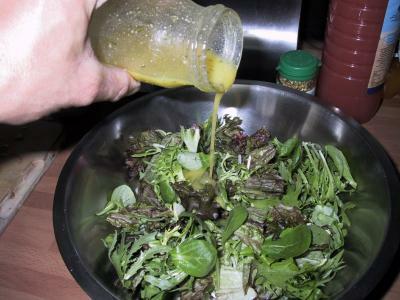 Also, it has flavor, there are other ways to dress it up, but your's is the best place to start. 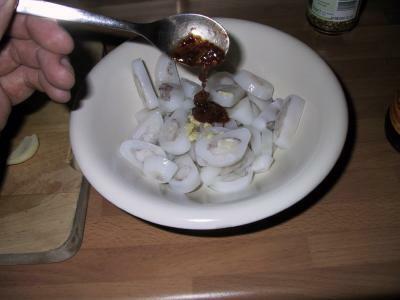 10 What area does squid salad known for? 10 I tried this with fresh scallops(cook them exactly the same) & I think they might be a 10 1/2. I'm keen on someone else trying it & see what they think? 10 Delicious. Good clear instructions easily followed. You can also use prawns and as my husband won't eat anything other than Cod, it is also delicious with strips of Cod. Many thanks. 10 I read this and immediately went out and bought the ingrediants. Looking forward to tomorrows lunch! 10 Another winner - can you show us how to cook game? 9 Excellent presentation, suitable for dummies, and looks delectable. 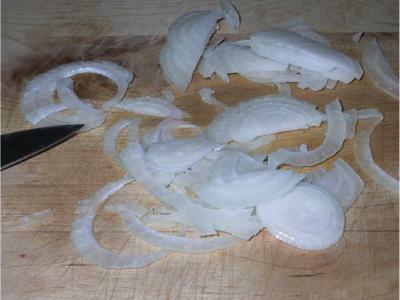 10 It looks lovely, fresh and quick - I'll have it tonight! 10 had this for dinner tonight - was REALLY good!! thanks! 9 Great page! If you could write more details about how to clean the squids (around here I only get fresh squids, not frozen). 8 Beautiful! It looks delicious, however, I wish there was a printer friendly version also.